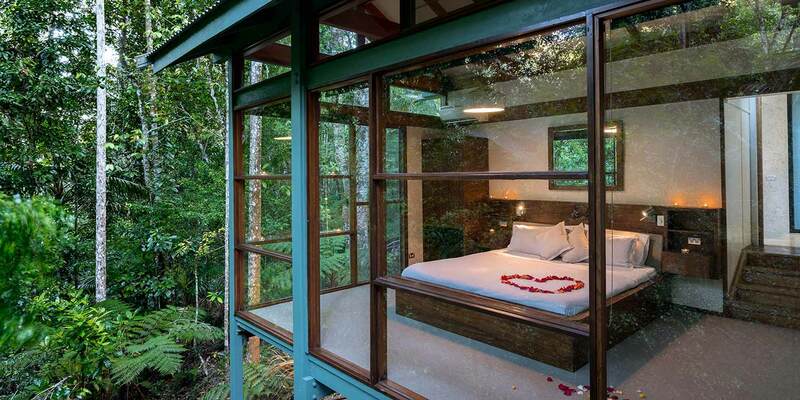 Romantic couples retreat in the rainforest. Creekside Spa Cabins with double spa baths and fireplaces. 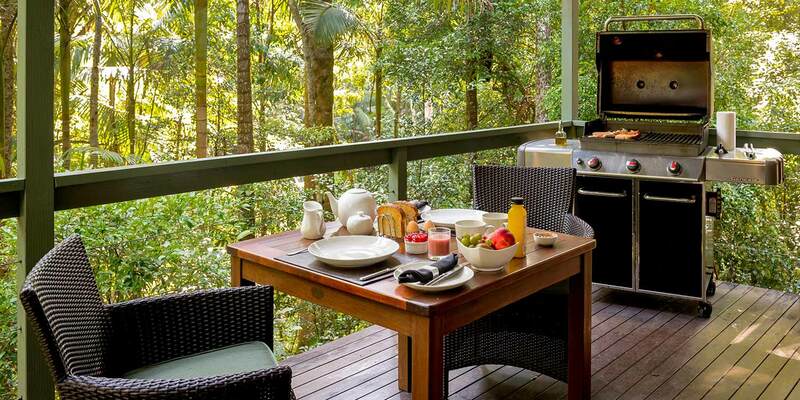 Romantic getaways NSW, just south of the Gold Coast. The Creekside Spa Cabins are set amongst the trees, close to the creek. These highly sought-after, traditional cottage-style cabins have a exposed ceiling beams of polished wood, giving a cosy, romantic feel. 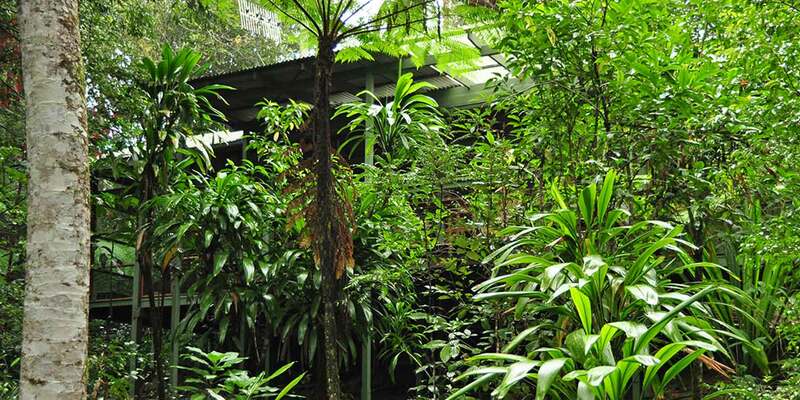 Expansive glass in all areas brings the tranquillity of the rainforest inside whilst preserving the feeling of comfort and intimacy. 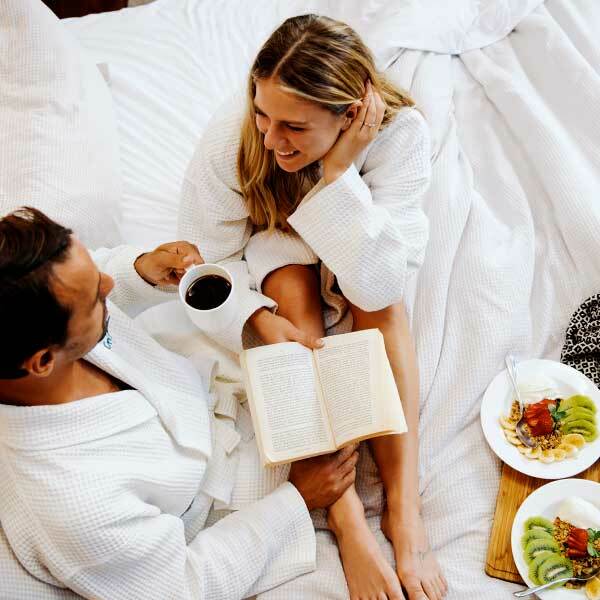 A separate bedroom with king-sized bed adjoins the en suite with its large double spa bath and floor-to-ceiling windows overlooking the rainforest. Served by a fully equipped kitchen with dishwasher, cooktop, black granite bench tops and striking cabinetwork, the dining area adjoins a spacious but intimate lounge. Braise the meat ingredients of your Gourmet Hampers on the barbecue – then bask in the sun on the lounges on the private open deck. The spacious living area has stylish new leather sofas and other furnishings complementing the glossy wooden floor. 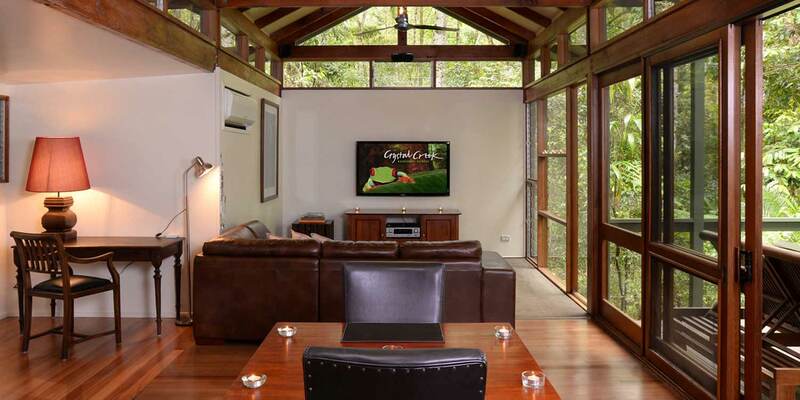 The cabins have top-quality televisions and DVD/Blu-ray/CD surround sound systems with speakers in every room, so you’re never far away from your ambient music. Reverse-cycle air conditioning in every room, including the bathroom, keeps you comfy all year round. 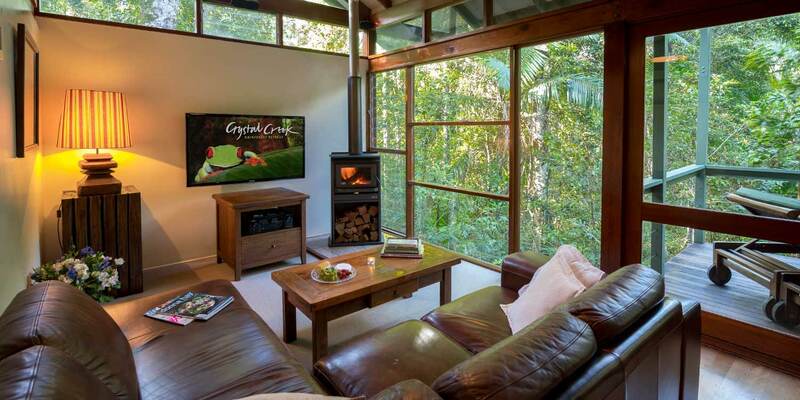 Set in dense rainforest, these intimate cabins with wood burning fireplaces create an idyllic romantic setting for you and your partner. Listen to the sound of the flowing creek as you wine and dine by candlelight. 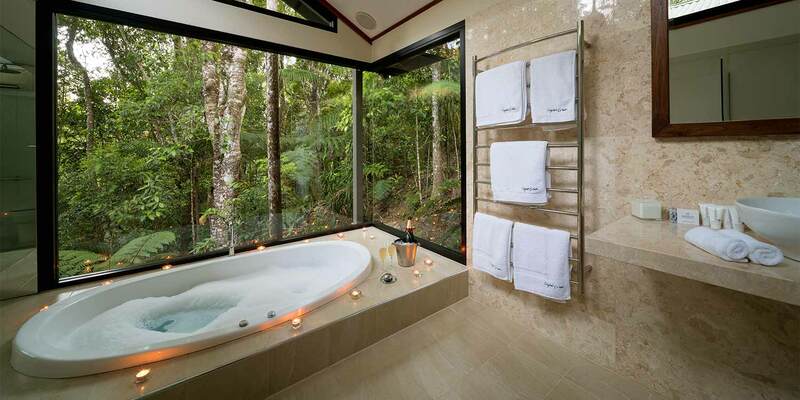 Surround the indoor spa with candles and gaze out the window at the beauty that is the Crystal Creek rainforest. 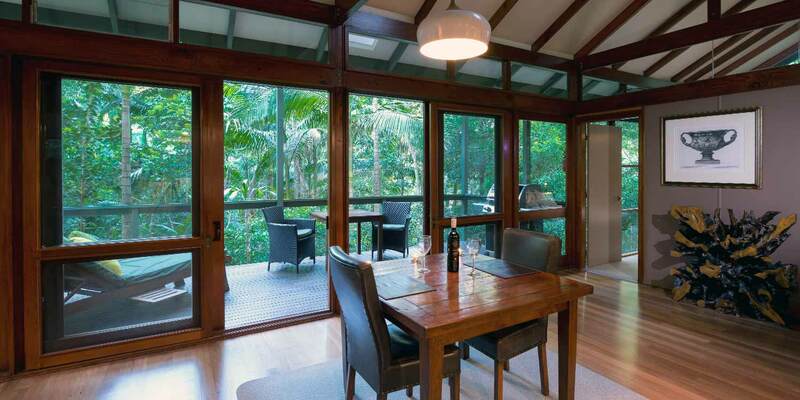 There are three Creekside Spa Cabins, called Tamarind, Carabeen and Quandong. Each accommodates one couple only. 9 April 2017My boyfriend thought he was clever and brought me up here as a surprise. This place is beautiful, loved the walks, glow worms and hammocks over the water. The weekend was topped off when my boyfriend proposed to me whilst surrounded by candles and roses with a beautiful dinner. We will definitely be back. 11 October 2015Simple as that. Everything was perfect. We will be coming back. 9 April 2016We have had the most wonderful stay, just perfect! Everything we had hoped for and much more! We look forward to our next stay. 22 August 2018Beautiful room and breathtaking location. Thank you. 13 December 2015Our stay here was spectacular. 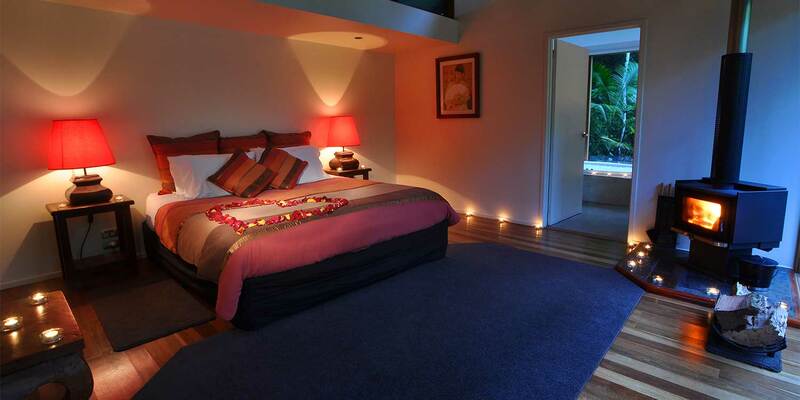 The creekside cabin has an awesome bedroom surrounded by rainforest. Having a spa in the enormous bathroom at night looking through the skylight was spectacular, as was sitting on the balcony over looking the creek. We didn’t try there meals which looked nice, because we only support organic produce so we brought our own food. If you bring a woman here and can’t get lucky, you should change teams. 8 June 2015We stayed here for our honeymoon in the Creekside Spa Cabin. 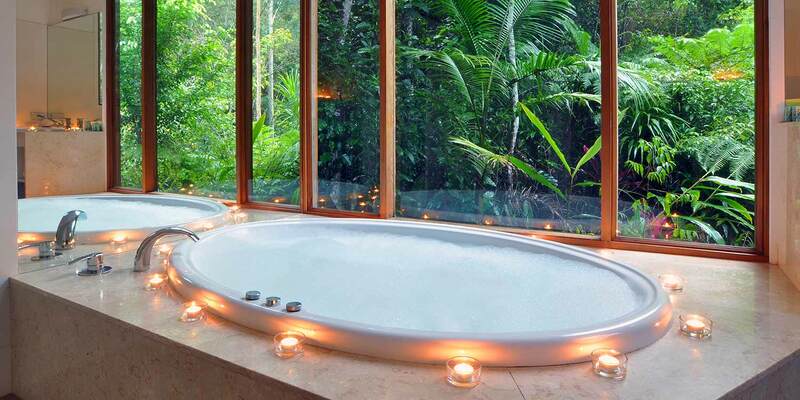 Beautiful setting surrounded by rainforest. Meals were delicious and very filling so worth it. 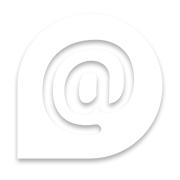 Staff were helpful and very friendly. Next time we plan to stay in the mountain lodge. 9 September 2016This was such an incredible place to be for our honeymoon. Food, staff, serenity, all of it was absolutely amazing and we cannot thank you all enough for creating such a beautiful place amongst the stunning nature. We will most definitely be coming back. Thank you, thank you, thank you. 13 September 2018We loved the natural forest walks and marvelled at the old trees. Resting in the hammocks was a treat. We loved the privacy of the lodge with resident frog. Staff are warm, welcoming and professional. The food was excellent. Thank you so much. 20 March 2017Such a beautiful quiet blissful place. The food was amazing, the staff were lovely and the views are to die for. Our honeymoon was perfect. 13 February 2015What a beautiful way to spend our couples getaway! The beautiful food and a couples massage just topped it off! Thank you! 23 December 2015Thank you for such a romantic and relaxing beginning to our Honeymoon. This was truly a treat and we cannot thank you enough. 27 August 2018We spent 5 days in CCRR creekside cabins “carabeen” for our honeymoon. absolutely amazing!! lookout walk was well worth the effort, staff exceptional and food divine! 15 July 2018We stayed for 2 nights in Quandong. This place is amazing! The food was absolutely delicious. The room was so cosy and relaxing. The only bad part of our time here was having to leave. Wish we could have stayed longer. We will be back. 18 January 2015We loved our stay here, loved sleeping to the sound of waterfalls. The food here is fabulous – definitely wouldn’t go hungry. There are so many luxuries, too many to name. Such a great place to be off the grid for our honeymoon. Thank you for creating such a beautiful place.